Draft: 2013, St. Louis Cardinals, 22nd rd. Combined with the Cardinals and Yankees to hit .322/.398/.671 (46-for-143) with 30R, 5 doubles, 15HR and 36RBI in 47 games...Hit .333/.405/.689 (44-for-132) with 28R, 5 doubles, 14HR, 33RBI and 15BB in 39 games (31GS at 1B, 4 at DH) over two stints with the Yankees this season (8/2-13, 8/21-9/30)…of his 44H, 19 went for extra bases (43.2%)…batted .393 (11-for-28) with 3 doubles, 3HR and 17RBI with runners in scoring position as a Yankee...Led all AL hitters (min. 50AB) with a 9.43AB/HR ratio (132AB, 14HR)…the next best was Oakland's Khris Davis (12.00)…of his 14HR with the Yankees, five tied the game (two) or gave the Yankees the lead (three)...Was acquired by the Yankees with international signing bonus pool money from St. Louis on 7/28 in exchange for LHP Chasen Shreve and RHP Giovanny Gallegos...Made his Yankees debut in 8/2 loss at Boston, starting at DH and going 0-for-4…collected his first Yankees hit with his 13th-inning single in 8/7 win at Chicago-AL...Had 41H in 116AB (.353 BA) after being recalled on 8/21...Hit .615/.667/1.308 (8-for-13) with 5R, 3HR, 7RBI and 2BB on the Yankees' five-game road trip from 8/21-26...Hit safely in a career-long six straight games from 8/22-28…also ended the season with a six-game hitting streak (from 9/24-30)...Hit an AL-high 14HR in 32G from 8/24 through the end of the season, the second-highest total in the Majors over the span behind only Milwaukee's Christian Yelich (15)...Hit 7HR over his final 11G, 10HR over his last 23G and 14HR over his final 32G...Recorded his first career multi-HR game and went 3-for-5 with 4RBI in 8/24 win at Baltimore…hit a game-tying two-run HR-his first HR as a Yankee-in the fourth and a two-run shot in the 10th…his 4RBI tied his career high...Reached safely in all 4PA on 8/26 at Baltimore, going 3-for-3 with 2R, 1BB and a second-inning two-run HR...Had a career-long 14-game on-base streak from 8/30-9/15, batting .271/.386/.563 (13-for-48) with 10R, 2 doubles, 4HR, 8RBI, 1HP and 8BB over the span...Hit go-ahead HRs in the seventh inning on 8/30 vs. Detroit and the eighth inning on 9/4 vs. Oakland...Homered in three straight games for the first time in his career from 9/2-4...Over his final 11 games (from 9/19), hit .419 (18-for-43) with 12R, 3 doubles, 7HR and 16RBI...Had multiple RBI in three straight games from 9/19-21 (7RBI total)…marked his first time collecting multiple RBI in consecutive games in his career...Hit solo HR and two-run HR and went 4-for-4 with 4R in 9/19 win vs. Boston…was his second career multi-HR game (also 8/24 at Baltimore) and marked career highs in runs and hits…became the second Yankee since 2008 to go 4-for-4 or better with at least 4R in a game, joining Aaron Judge (4-for-4, 4R, 1 double, 2HR, 3RBI, 1BB on 6/11/17 vs. Baltimore)...His two-run HR in 9/20 loss vs. Boston was the Yankees' 246th homer of the year, surpassing the previous club record (245HR in 2012)...Was named AL "Player of the Week" for 9/24-30, batting .458/.519/.958 (11-for-24) with 5R, 3 doubles, 3HR and 8RBI…led the AL in total bases (23) and tied for AL lead in hits, HRs, RBI and XBH (6)…was his first career weekly award...Ended the season with a career-long five-game RBI streak (9/25-30), driving in eight runs over the span…extended the streak to seven games with 2RBI in each of his first two playoff contests...Made his postseason debut, starting all five Yankees games at 1B and batting .235 (4-for-17) with 2R, 1 triple, 4RBI and 4BB...Hit a two-run triple in the sixth inning of the AL Wild Card Game vs. Oakland, his first career triple (regular or postseason)…also had 2RBI in ALDS Game 1 at Boston, becoming third Yankee since 1908 with at least 2RBI in each of his first two career postseason games (also Ben Chapman and Bill Dickey, each in Games 1 and 2 of the 1932 World Series vs. the Cubs)...In nine games with the RailRiders, hit .310 (9-for-29) with 2R, 2 doubles, 1HR and 3RBI...Appeared in eight games for the Cardinals, hitting .182 (2-for-11) with 1HR and 3RBI…also saw time with Triple-A Memphis (67 games) and Double-A Springfield (two games), combining to bat .300 (72-for-240) with 36R, 16 doubles, 2 triples, 10HR, 37RBI, 32BB, a .392 OBP and a .900 OPS in 69 games. Was purchased from Memphis (AAA) on 6/25 and made his MLB debut as a pinch-hitter that night vs. PIT. Was hit by pitch, a 96 MPH fastball from Jhan Marinez ... Made 18 starts with 17 at first base and one as designated hitter ... Recorded his first MLB hit with double vs. CIN (6/26) after getting his first career start at first base ... Hit his first MLB home run vs. MIA (7/3) off Jarlin Garcia, going 2-for-5 with a double and season-high 4 RBI ... Tied his season-high of 4 RBI at MIL (8/29) ... Had two hits off the bench at BOS (8/15) with a double and a single ... Homered three times over a period of seven games (7/3-9) in the homestand prior to the All-Star Break ... Was 10-for-33 (.300) with a home run as a pinch-hitter, one of three Cardinals with 10 pinch-hits in 2017 (Greg Garcia & Jose Martinez) ... Hit first career pinch-hit home run vs. CHI (9/25), a solo shot off Brian Duensing, it was his first home run hit after the All-Star Break ... Batted .327 with 13 HR, 50 RBI and 23 doubles in 74 games for Memphis ... Was optioned to Memphis on 8/21 for four games (8/22- 26) and recalled on 8/27 ... Was ranked among the Pacific Coast League leaders in batting (.322, 10th), hits (82, 10th), RBI (48, 10th), doubles (23, T1st), OBP (.406, 4th), slugging (.561, 9th) and OPS (.967, 4th) at the time of his purchase in June. • Hit 2 HR vs. Round Rock (4/28) and vs. Colorado Springs (6/14), and homered in three straight games (4/9-11) ... Named Cardinals Minor League Player of the Month for April, batting .360 (27-75) with 5 HR, 16 RBI and 13 of his 27 hits for extra bases. Named to the Texas League Mid-Season and Post-Season All-Star Teams. Started as the designated hitter for the North Squad and was 2-for-5 with a double and an RBI ... Named Cardinals Minor League Player of the Month for August batting .366 (34-93) with seven doubles, a triple, four home runs and 20 RBI over 26 games ... Led the Texas League in batting (.297), games played (134) and hits (143) ... Ranked among the Top 5 in the league in RBI (74, 4th), on-base percentage (.372, 3rd), extra base hits (53, T3rd), triples (5, T3rd), runs (70, 3rd) and total bases (230, 3rd) ... Ranked among Cardinals minor league leaders in runs (2nd), hits (2nd), doubles (T9th), triples (T4th), home runs (T3rd), RBI (3rd), walks (6th), slugging (6th) and OPS (8th) ... Ranked 10th among all Double-A players in hits ... Posted a multi-home run game going 4-for-5 with 5 RBI and three runs scored vs. Corpus Christi (7/8) ... Ran off 14-game (7/3-17; .380, 19-50) and 13-game (5/2- 15; .320, 16-50) hitting streaks, which ranked T5th and T8th longest in the Texas League. Named a Florida State League All-Star for the South Squad. Played the entire game as designated hitter going 1-for-4 with an RBI ... Collected 31 RBI (.330 BA, 5 HR) in August, the 3rd-most in all of minor league baseball in the month of August ... Tied the Palm Beach single-season record with 77 RBI (Allen Craig, 2007), ranking 2nd in the Florida State League ... Ranked among FSL leaders in on-base percentage (.360, 3rd) and walks (63, 2nd) ... Was 3-for-9 with three doubles and two RBI in the FSL playoffs. Tied for the most among playoff participants in doubles and extra base hits and ranked 5th in batting (.333) and 2nd in slugging (.667). Ranked 4th in the Florida State League in slugging percentage (.442) ... Ranked 10th among Cardinals minor leaguers in both doubles (21) and slugging percentage (.442). • Hit two home runs at Clearwater (7/13) ... Posted a single-game high with four hits twice (at Daytona 5/28 & vs. Jupiter 6/17). Played in 46 games, starting 43 at catcher, and threw out 38.0% (19-50) of attempted base stealers, ranking 4th in the New York-Penn League ... Hit first professional home run vs. Mahoning Valley (7/9), a solo shot off Robert Whitenack. August 21, 2018 New York Yankees recalled 1B Luke Voit from Scranton/Wilkes-Barre RailRiders. August 13, 2018 New York Yankees optioned 1B Luke Voit to Scranton/Wilkes-Barre RailRiders. August 2, 2018 New York Yankees recalled Luke Voit from Scranton/Wilkes-Barre RailRiders. 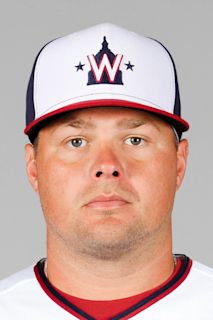 July 31, 2018 Scranton/Wilkes-Barre RailRiders activated 1B Luke Voit. July 29, 2018 New York Yankees traded LHP Chasen Shreve and RHP Giovanny Gallegos to St. Louis Cardinals for 1B Luke Voit and Future Considerations. July 29, 2018 1B Luke Voit assigned to Scranton/Wilkes-Barre RailRiders. June 18, 2018 St. Louis Cardinals optioned 1B Luke Voit to Memphis Redbirds. June 15, 2018 St. Louis Cardinals recalled Luke Voit from Springfield Cardinals. June 13, 2018 1B Luke Voit assigned to Springfield Cardinals from Memphis Redbirds. June 11, 2018 St. Louis Cardinals optioned 1B Luke Voit to Memphis Redbirds. May 31, 2018 St. Louis Cardinals recalled Luke Voit from Memphis Redbirds. May 4, 2018 St. Louis Cardinals optioned 1B Luke Voit to Memphis Redbirds. May 1, 2018 St. Louis Cardinals recalled Luke Voit from Memphis Redbirds. April 19, 2018 Memphis Redbirds activated 1B Luke Voit from the 7-day disabled list. April 6, 2018 Memphis Redbirds placed 1B Luke Voit on the 7-day disabled list. March 23, 2018 St. Louis Cardinals optioned 1B Luke Voit to Memphis Redbirds. August 27, 2017 St. Louis Cardinals recalled Luke Voit from Memphis Redbirds. August 21, 2017 St. Louis Cardinals optioned 1B Luke Voit to Memphis Redbirds. June 25, 2017 St. Louis Cardinals selected the contract of Luke Voit from Memphis Redbirds. March 30, 2017 1B Luke Voit assigned to Memphis Redbirds from Springfield Cardinals. February 27, 2017 1B Luke Voit assigned to St. Louis Cardinals. October 27, 2016 Tiburones de Aguadilla released 1B Luke Voit. October 27, 2016 1B Luke Voit assigned to Tiburones de Aguadilla. April 6, 2016 1B Luke Voit assigned to Springfield Cardinals from Palm Beach Cardinals. March 12, 2016 1B Luke Voit assigned to St. Louis Cardinals. June 5, 2015 1B Luke Voit assigned to Palm Beach Cardinals from State College Spikes. June 2, 2015 1B Luke Voit assigned to State College Spikes from Palm Beach Cardinals. May 20, 2014 1B Luke Voit assigned to Palm Beach Cardinals from State College Spikes. June 13, 2013 C Luke Voit assigned to State College Spikes. June 11, 2013 St. Louis Cardinals signed C Luke Voit.